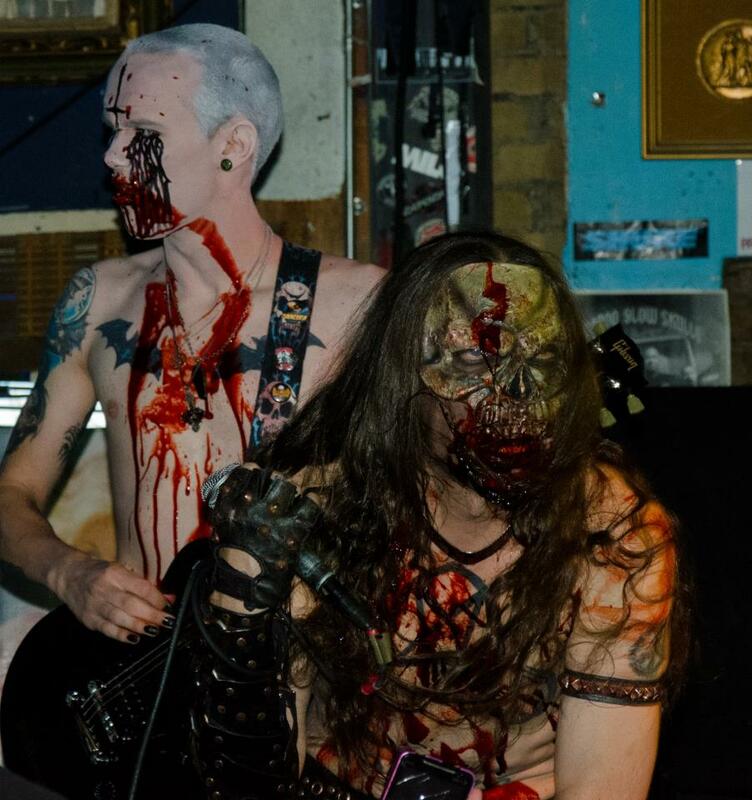 Shadow Windhawk is the the lead guitarist & back up vocalist for the long-running Salt Lake City based Horror Punk band, DieMonsterDie. The band is currently hard at work on their 8th studio full-length album, which is called: “October 21st, 1976”. The album was successfully funded on a $6,000 goal on Kickstarter over the summer this year. 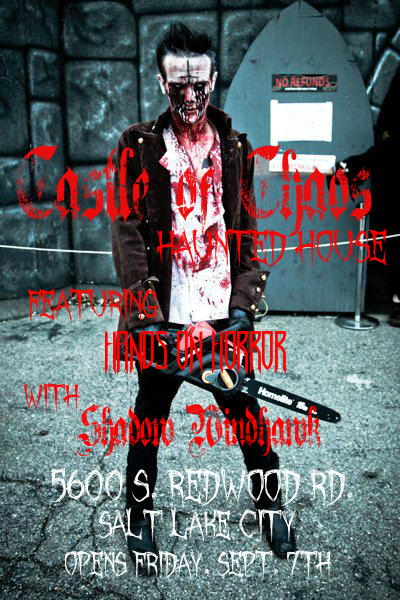 In addition, Windhawk is the lead actor at Castle of Chaos Haunted House in SLC, Utah, where he also works as makeup fx artist and acting coach. “I have been working in haunted houses for the last five years of my life. 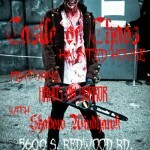 At Castle of Chaos I am known for putting on a unique and extremely intense interactive line show while customers wait to enter the attraction, which is not to be found anywhere else in Utah and is considered unusual in haunts across the US. If you could implement a new Halloween tradition, what would it be? If I could implement a new Halloween tradition…hmm. That’s a tough one. One thing that people are trying to make a “safer tradition” out here in the armpit of hell, Utah is something called “Trunk or Treating” where kids parents all park in a mall parking lot and kids go “trick or treating” and collect pre-checked candy out of the trunks of cars. This is blasphemous and wrong on so many levels. I suppose if I had the power to implement a new tradition I would instead use said power to re-affirm an old and important tradition. When you trick or treat, you do it in real neighborhoods with real people and real jack o’ lanterns. You do it on the wet streets with real dead leaves falling around you and the moon shining bright through dark clouds overhead. You never trick or treat in a sterile, stifling indoor shopping complex or out of the trunks of your parent’s cars in some god forsaken parking lot wasteland with no trees or houses. There is this bizarre and disturbing need that has arisen in America that people need to constantly give up freedoms and sacrifice time for enjoyment and fun in the sake of ‘security’…instead of having simple activities like trick or treating, where the dark of night adds to the mystery of the costumes and makes Halloween special. People in this country are too paranoid from the mainstream media feeding their brains. Everything that used to make American life grand is ‘too dangerous’ these days. It used to be parents felt comfortable letting their kids discover the great things in life like Halloween independently. But in today’s America, Halloween is dying. I can feel it changing…those old traditions are departing and it is depressing for a die-hard like me to watch. Personally I just try as much as possible to fully embody all the old traditions of Samhain through my craft and carry the torch of old school Halloween fun with me everywhere I go. It’s all I can do in the face of a fearful and changing society. So, I’d rather implement old traditions rather than any new ones. Why fix or add to something that is already perfect, you know? I’ve never understood the difference between candy out of the trunk of a car or out of a bowl from someones house. I think it’d be safer to go to someones house since you KNOW where they live and can track the candy. Trunk or Treat events are usually conducted by community groups or churches who already live in YOUR neighborhood. Why not enjoy the exercise and the TRADITION of Halloween…. Maybe that’s the decline of the ‘neighborhood?’ I don’t really know any of my neighbors by name and haven’t really since I’ve been living on my own. I can see how Trick or Trunk activities sort of enforce control over the process, removing some of the variables (darkness, walking) that might make the night hazardous. But like you said, Monique, it takes out the exercise and the adventure.